A Leg Up on the Competition? 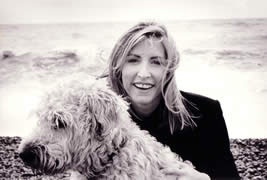 The big n ews about this program, which premiers March 19, 2007 is Heather Mills! She will be joining Laila Ali, the daughter of Muhammad Ali, country music star Billy Ray Cyrus, former 'N Sync boy-band member Joey Fatone, Olympic speed-skater Apolo Anton Ohno, former basketball star Clyde Drexler, TV-radio host Leeza Gibbons, and actor Vincent Pastore, who appeared on The Sopranos. Though she has been in the headlines for months due to the knock-down, drag-out multi-million dollar divorce between her and Paul McCartney, the real news about this show is that she will be a first! Heather Mills will be the first amputee to compete in this dancing contest and Las Vegas odds makers are already taking down bets on whether she will send the prosthetic leg flying into the audience, or not.